Dozens of Israeli soldiers invaded, on Tuesday at dawn, the Deheishe refugee camp, south of the West Bank city of Bethlehem, in the occupied West bank, and clashed with dozens of local youngsters, before shooting and injuring eight Palestinians, including a medic, and abducted a young man. The invasion into the refugee camp was carried out by dozens of soldiers, and several armored military jeeps, before the soldiers stormed homes and violently searched them, causing damage. The soldiers also fired many live rounds, rubber-coated steel bullets, gas bombs and concussion grenades at the Palestinians and their homes. Medical sources said the soldiers fired a live round, from a close range, at medics working with the Palestinian Medical Relief, wounding one in the leg, before invading his home and ransacking it, in addition to attacking his father and abducting his brother. The soldiers also shot and injured five Palestinians with live rounds, in their legs, and one with a rubber-coated steel bullet, during the clashes that erupted in the refugee camp. In related news, several army vehicles invaded the al-‘Obeyyat area, east of Bethlehem, searched homes and summoned a young man, identified as Khalil Mohammad Obeyyat, for interrogation at the Etzion military base and security center, south of Bethlehem. The soldiers also invaded and ransacked the family home of Hussein Obeyyat, who was assassinated by the Israeli army in 2000. In addition, the soldiers abducted three young Palestinian men from their homes, in Beit Ummar town, north of Hebron, in the southern part of the occupied West Bank. 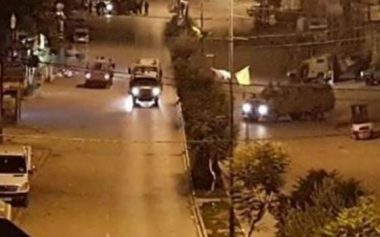 The soldiers also invaded Abu Dis town, east of Jerusalem, broke into and searched homes, and abducted two Palestinians, including a former political prisoner.